It is this challenge that I undertake daily with my family's mixed bag of various likes, dislikes, aversions, possible lactose intolerances, foods only eaten raw, foods only eaten cooked, soft foods for wiggly teeth, strict beef jerky diets, non-strict poultry-only-for-today-but-not-tomorrow diets, and the list goes on... and this doesn't even include my own weird food rules of what I will or won't eat. To cook in my house is, well, a challenge. Although I am not vegan (far from it, actually! ), I enjoy vegetarian food and cook vegan or vegetarian meals often. My husband, bless his carnivorous heart, will eat whatever I make. He may nod, give me a half-hearted thumbs up or even finish his single-helping of brown rice salad to prove that he still loves my cooking after 15 years of wedded bliss. But when he takes one bite and says I have perfected a recipe and tells me I should invite his family over to taste this wondrous creation, I pause. I feel my head swivel an awkward 180 degrees while my right eyebrow shoots up: What was that? Can you repeat that? I feel more than a hint of satisfaction when the meat-eater of the house declares I've made a decent replication of a restaurant dish that he loves---but vegetarian-ized. Here is it is, see if you miss the meat. And make everyone happy...vegetarians and carnivores alike! This soup is so entirely delicious, you may be tempted to double the recipe. I keep leftover tomato paste in the freezer in baggies and they come in handy for small amounts such as this. Peanut butter makes the best version but I have used almond butter in a pinch. 1. In a large soup pot, sauté chopped onion, celery, and carrot in vegetable oil until tender, stirring frequently, for about 5 minutes. 2. Add garlic and red pepper flakes and sauté for another minute. 3. Add soy sauce, broth, sesame oil, lime juice and tomato paste and bring to a boil. Simmer for 5-10 minutes. 4. Using a hand blender, or stand blender, add peanut butter to soup mixture and process so that some vegetable bits remain (turn it on and off quickly for a few seconds to incorporate the peanut butter). Keep warm over low heat until noodles are cooked and drained. 5. 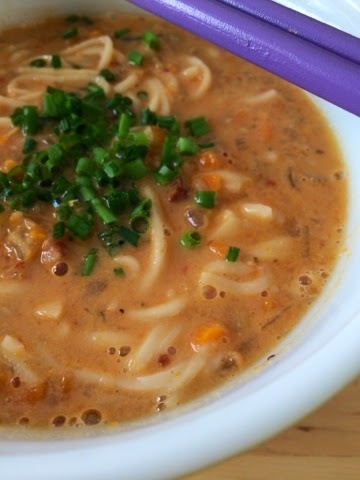 Add approximately 1 cup of noodles to each bowl and divide soup mixture among bowls. Garnish if desired. Note: The soup thickens as it sits, if the soup becomes too thick, add hot broth or hot water to the bowl. 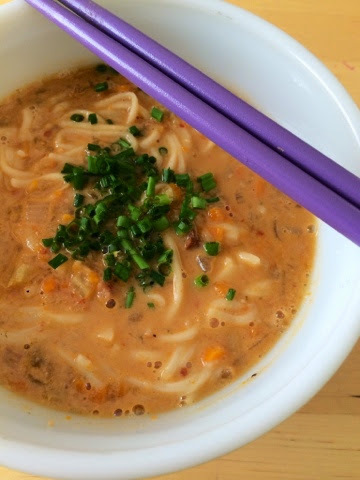 IF you happen to have leftovers, store soup base and noodles in separate containers until reheating. VEGAN? 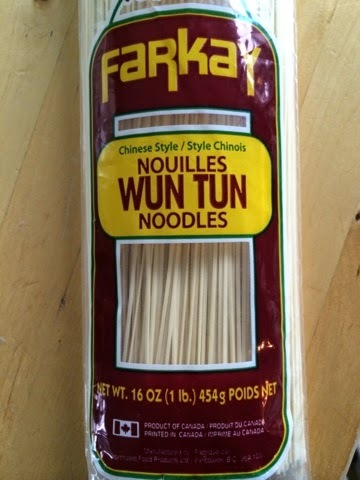 This is easily converted to vegan if you use non-egg noodles but I generally recommend egg noodles for their thickening power in this delicious, thick soup. MILDER? This soup can be easily adapted to have less spice by adding additional broth to individual bowls with about half soup base. SPICIER? Add more spice by adding more chili flakes to the bowl. FUSSY KIDS? 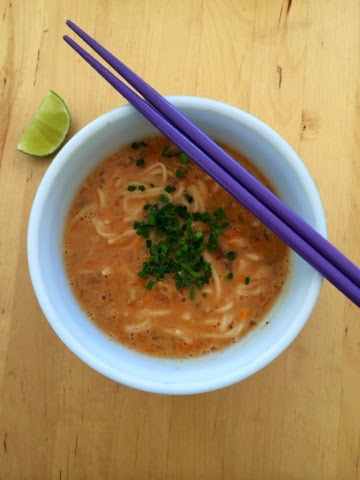 If you have really fussy eaters in your house, just pour broth over cooked noodles and peas. Voila! Everyone happy!